Larry D. Spears writes: With so little enthusiasm, this summer's "slow-motion" rally may be coming to an end. •They simply sell their shares, taking the profits they've built up over the past few months. However, that action can often have undesirable tax consequences - plus, it eliminates the opportunity for added profits if the markets keep on rising. •They buy protective put options locking in their paper gains- essentially creating an "insurance policy" against future losses. The problem is that can also be quite expensive. To see exactly how that might work, let's assume you own 100 shares of Amazon.com stock, having purchased it at $190 a share back in April when it first broke out of a long see-saw trading range. With the stock now trading at roughly $245.20, you've earned a profit of $55.20 a share, or $5,520 on your full position. That's a really nice gain. But let's say you really don't want to sell your shares or spend in the neighborhood of $1,100 to buy a protective put. So, you decide to structure a collar. •BUY a protective at-the-money October $245 Amazon put option for $11.00, or $1,100 total, as an insurance policy on the stock. That raises your total cost basis to $25,620. •Then simultaneously SELL an out-of-the-money October $255 AMZN call option for $6.25, or $625 for the full contract. That final transaction creates an option collar around your Amazon stock and reduces the cost basis for the entire position to just $24,995. Remember, though, that your new out-of-pocket expense is just $475 ($1,100 - $625 = $475) because you already owned the AMZN stock. There's also no margin requirement on the call you sell because it's "covered" by your underlying Amazon stock. •If Amazon stock continues to rise, climbing above $250 a share, you'll add to your already substantial profits, picking up a maximum additional gain of $505 at any AMZN price above $255. •If Amazon drops back sharply, the absolute maximum portion of your existing $5,520 profit that you can give back is $495 - even if AMZN plunges all the way to $180 a share, where it traded in early March. In other words, you get the potential for another $505 in gains, and guaranteed protection against losing more than $495 of your existing profit - a guarantee that's good until Oct. 19 (at which time you can position a new collar if you're still worried about a market top). This strategy can be used to lock in profits on almost any individual stock on which you have substantial gains, not just higher-priced issues like Amazon. 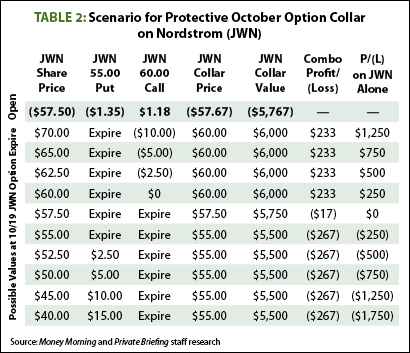 For example, consider high-end department store company Nordstrom Inc. (NYSE: JWN). It's had a very nice run this year, rising from $46.80 back on June 1 to a new 52-week high of $58.37 just last Friday. That means anyone who was aboard for the full ride and owned 100 shares is sitting on gains of around $1,150 in under three months - but it's also likely they're sitting on some worries. That's because JWN is up against strong technical resistance at these levels. Plus, with the economy showing continued sluggishness, discretionary spending will likely be limited for the rest of the year, which will hit high-end retailers the hardest. But as Table No. 2 shows, if you turn your long JWN stock position into an option collar, you can set yourself up to make up to $233 in added profits if the stock keeps climbing, while guaranteeing you'll give back no more than $267 of your current gains should the stock plunge - even if it falls back to its 52-week low near $40. •Abbott Labs (NYSE: ABT), $65.85 - 52-week range $48.63-$67.45. Buy the November $62.50 put ($0.87) and sell the November $70.00 call ($0.31) and get a maximum added profit of $352 at any ABT price above $70, with a maximum additional loss of $398 at any price below $62.50. •Eli Lilly & Co. (NYSE: LLY), $44.40 - 52-week range: $34.94-$45.01. Buy the October $43 put ($0.85), sell the October $46 put ($0.90); maximum added profit of $165 above $46; maximum added loss of $135 below $43. •Lennar Corp. (NYSE: LEN), $32.20 - 52-week range $12.14-$32.85. Buy the October $32 put ($1.95), sell the October $35 call ($0.85); maximum added profit of $170 above $35; maximum added loss $130 below $32. •Amgen Inc. (Nasdaq: AMGN), $84.70 - 52-week range $52.50-$85.28. Buy the October $82.50 put ($1.65), sell the October $87.50 call ($1.35); maximum added profit of $250 above $87.50; maximum added loss of $250 at any AMGN price below $82.50.